Jingle Bells/ Jingle Bells/ Jingle All the Way! Who doesn’t know this Christmas song? So many songs around this time of the year use bells for imagery and of course, for their sound. “Jingle Bells” really has a festive ring to it, right? Some cultures use the banging of a gong or the ringing of a bell to summon the community to an important gathering. During Spanish times, the life of most Filipinos revolved around the town plaza. The bell was rung to mark various religious and communal occasions. In the Bible, the High Priest Aaron had to wear a robe that had alternating bells and pomegranates sewn on the hem: “a golden bell and a pomegranate, around the hem of the robe.” And “it shall be on Aaron when he ministers, and its sound shall be heard when he goes into the Holy Place before the Lord, and when he comes out, so that he does not die” (Exodus 28:34–35). The High Priest wore bells when he enters the most Holy Place in the tabernacle. Priests used them as a sign that they were entering on behalf of the rest of the people into God’s Most Holy Presence. My ESV Study Bible notes that it isn’t so much that God wants to know when the priest is coming, as it is a sign to approach Him with reverence. In short, to come before God was not to be taken lightly. That was just one of the many tasks a priest had to fulfll during Aaron’s days. The high priest was also the one who oﬀered daily sacrifces for the people’s sins, including his own. Jesus came, He changed the nature of priesthood forever in a powerful and radical way. Jesus approached the throne of God the Father with the payment for our sins, and He did not need to pay for His sin, because He was holy, pure, and sinless. He approached the throne of God the Father with a sacrifce, only this time it wasn’t the blood of a bird or a lamb that was shed but His very own. He oﬀered what nobody ever could—the precious blood of a sinless man! Jesus reigns until today because death is powerless to prevent Him from continuing with His holy role. His priesthood is permanent unlike the priests before Him who had to abide by many rules, who had to come from a certain bloodline, and whose roles ended when they died. Jesus alone has the power to rule and to live with no end. 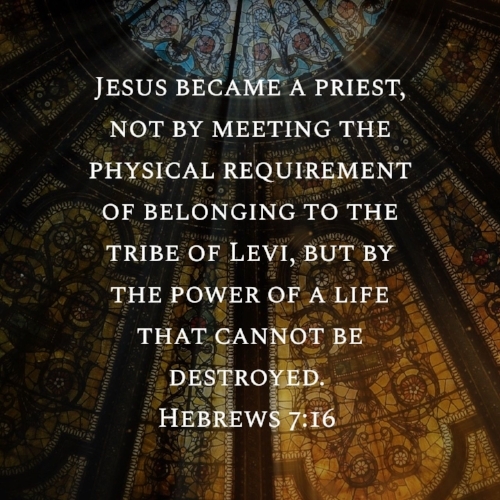 Jesus is no ordinary priest and He is the highest one of all. The next time we hear bells ring, whether in songs, or in churches, I pray the ringing will serve as a call to unite us all to come to the Most Holy Lord Jesus Christ. May the bells remind us to approach with reverence the One who had no sin but who oﬀered Himself as a sacrifce on behalf of us sinners. When you see Christmas decors that have bells on them, meditate on how the symbolism of bells point to the meaning of Christmas. Jesus Most High and Most Holy Priest, we adore You! How sweet is the sound of the bells ringing around this time of the year. May they unite us in praise and worship for You, O Lord, who so deserve it. We thank You! We magnify You. We glorify You! And we proclaim the power of Your sinless life, of Your precious blood and Your indestructible life over ours. You are worthy. This is an excerpt from Better Than Jewels by Rica Peralejo - Bonifacio, now available at OMF Lit and Passages Bookshops, PCBS, and our online store, passagesbooks.com for only P425. Join Rica Peralejo-Bonifacio every week of the year in Better than Jewels. In this weekly devotional she shares her reflections on the joys and trials of motherhood, generosity and gratitude, love and sacrifice, and hard lessons from her past. Each weekly entry comes with a page for journaling. You are encouraged to write down your own reflections and applications after every devotional entry. As you read this devotional, may you discover that the wisdom found in God’s Word is far better than all the jewels in the world.